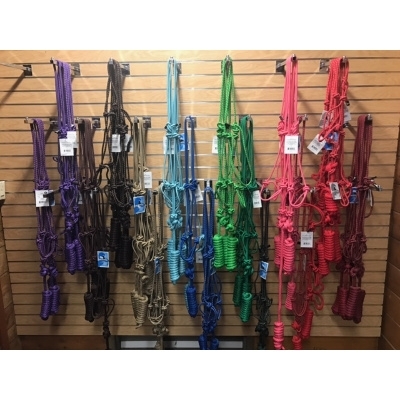 Stop by to see our full selection for your equine friend! Hand-tied from 1/4" kernmantle rope, this Silvertip rope halter offers the perfect combination of strength and flexibility. Featuring a not-too-long, not-too-short 5/16" x 12' yacht braid lead that's the perfect length for tying on the trail or using on the highline. You'll like the way the smaller diameter rope fits comfortably under a headstall or in a saddle bag. Handcrafted by Weaver Leather craftspeople in Mt. Hope, Ohio. Hand-tied with pride, this Silvertip rope halter with 8' solid braid split reins is designed to meet the needs of bitless riders. The same quality materials and construction as the ever-popular No. 95 Halters go into this high performing design. Handcrafted by Weaver Leather craftspeople in Mt. Hope, Ohio.